Star Wars Battlefront gets its highly anticipated DLC today, introducing the Death Star and all the space battles and on-foot action that goes along with that setting. 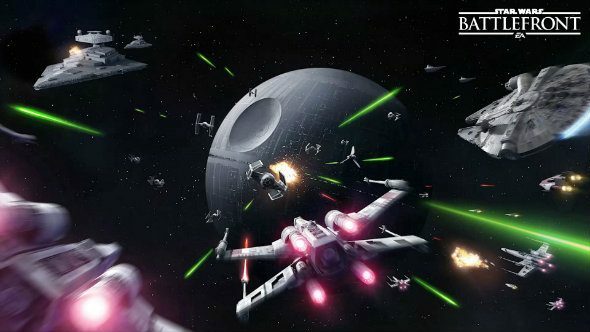 If you’re looking for more galactic conflicts, check out our list of the best space games. Along with the arrival of Chewbacca, Bossk and all that other good stuff, the patch also makes a few improvements and tweaks for those who don’t have the Season Pass. The Death Star DLC – which includes five new maps, two new heroes, the Battle Station mode, more weapons and Star Cards – launched today for Season Pass owners (everyone else has to wait two weeks), but the other changes the patch introduced are live for everyone today. Everyone benefits from the usual series of bug fixes, with some spectator camera issues sorted, along with some audio problems. The Bacta Bomb’s benefits should also now be more obvious on your health bar. As for other changes, Battlefront’s level cap has been raised from 70 to 90, there are a bunch of free costumes for everyone and there are a number of changes to Star Cards, traits and weapons, including the ability to dual wield traits. Soldiers can also no longer pistol whip Darth Vader while he’s force choking them, and Palpatine has been buffed. For the full patch notes, head over to the official EA post.